It’s September 8th and the flow is on! 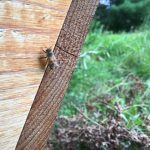 The nectar dearth was rough and the Willow and Orchard Hives have had a difficult time adding food stores to their hives for winter. 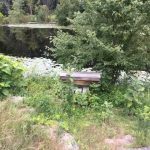 The Meadow Hive is a very different story! 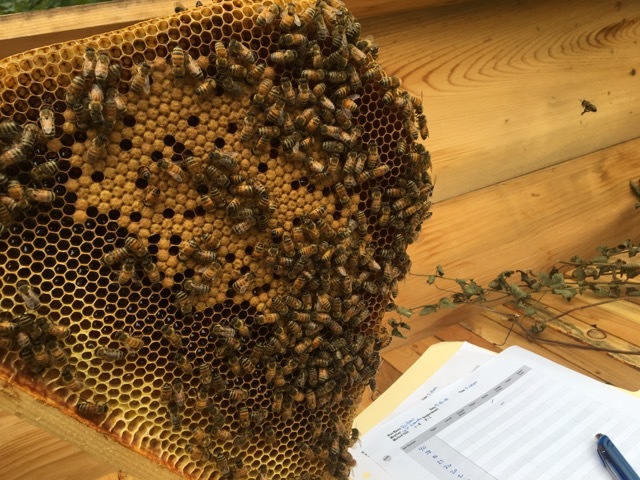 That hive is doing really well and they have plenty of honey to make it through the winter. My focus now is on the Willow and Orchard and making sure they have food for the winter. Now that the flow is here they should be able to build up some of their food stores. 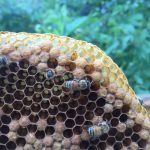 With winter on my mind, I also decided that I need to start getting the outside of the hives ready. 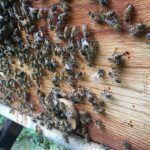 In the morning I went out to the farm to oil the hive lids with tung oil and to put silicone caulk into the spaces of the lid where there are small openings. During this season, I have noticed that there has been some water inside the lids and I want to try to stop that from happening before winter. 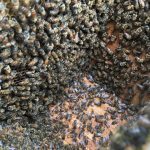 It’s not a good idea to have frozen water close to the bees. 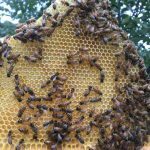 If is melts and goes into the hive and then freezes again is what causes the problems. The tung oil needs two to three coats to be effective and they need to be put on about twelve hours apart. This allows the oil to dry and harden, sealing the outside of the lid. Since the hives have bees in them, I am only oiling the lids. 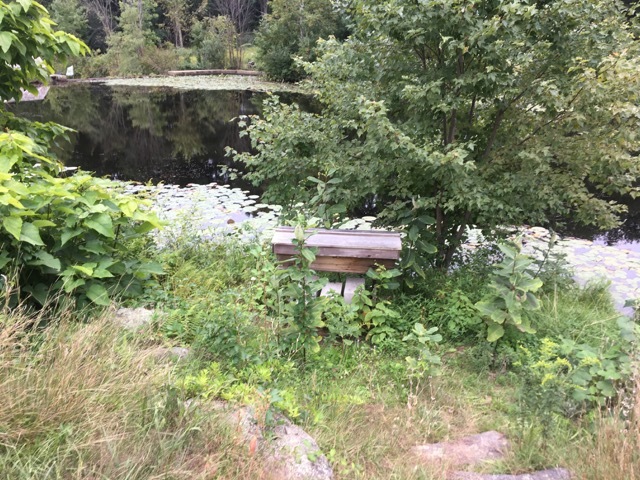 The tung oil has a strong smell and the bees do not like it. Due to rain in the forecast, I am planning to only put on two coats this year. 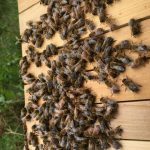 The Meadow Hive does not need to be oiled since it was painted and sealed. It is well protected from the elements. 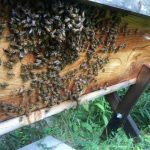 Since the Meadow Hive is so strong and full, I don’t feel that I need to bother them this time with an inspection. 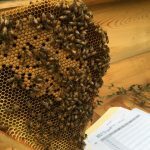 This hive will probably only get one more inspection for this season unless something changes in the hive. 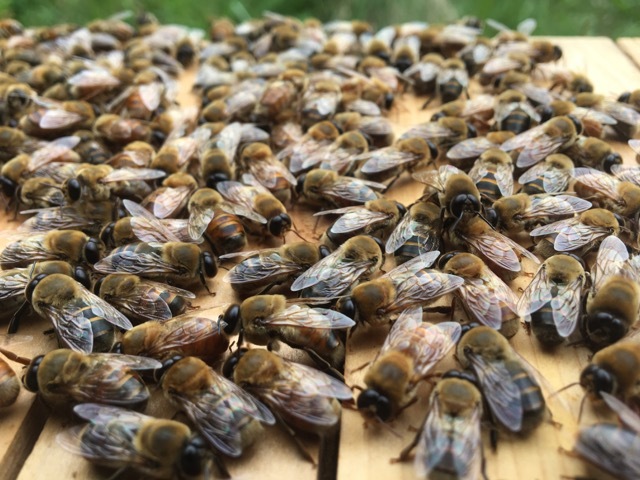 In the afternoon, I headed back to the farm to inspect the bees. Waiting to inspect allowed the oil to dry before I opened up the hives. 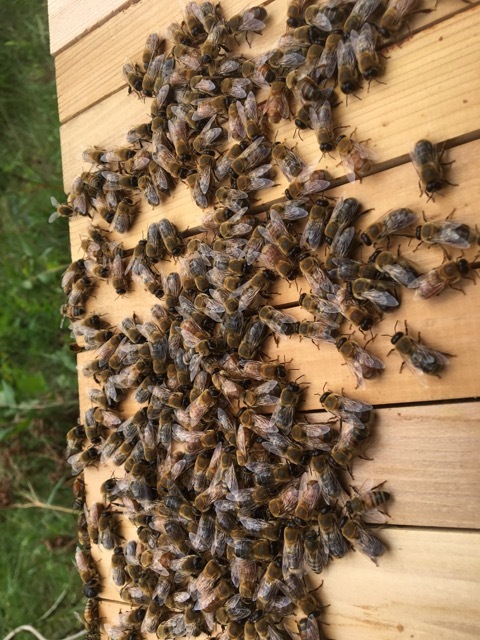 One more coat of oil would need to be put onto the lids after inspecting the bees. 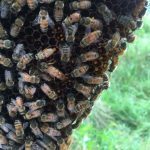 The Willow and Orchard Hives have been getting sugar syrup for a few weeks now since there has been a nectar dearth and they were very low on stores. The Willow colony has been consuming much more of the syrup than the Orchard colony. The Orchard colony needs to pick up the pace and store more food. 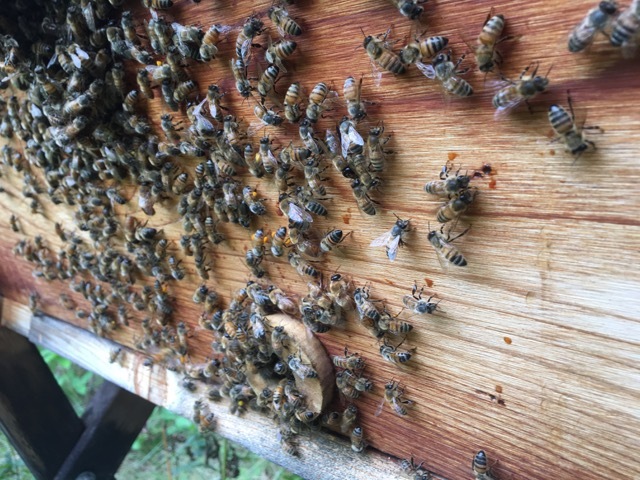 I have yet to figure out winter feeding in a top bar hive. I will continue to feed them syrup until the weather is too cold for them to take in the syrup. 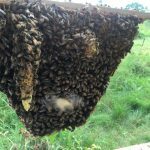 Between the feeding and the nectar flow there should be an increase in food stores. 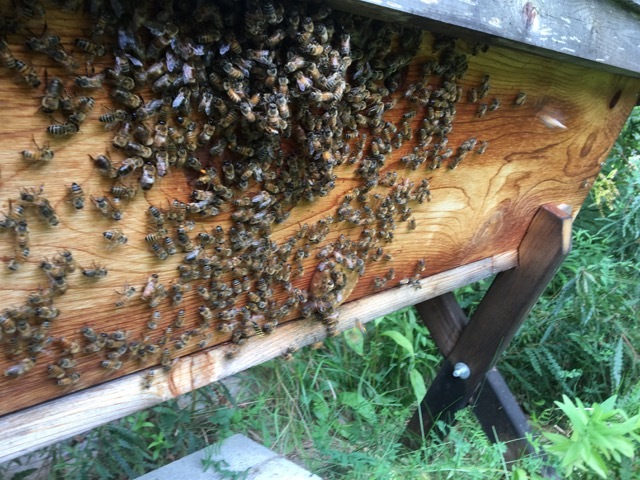 Today, I started at the Orchard Hive. 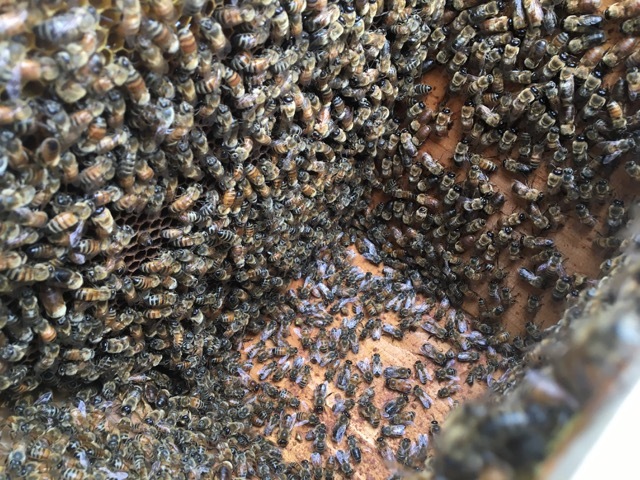 When I looked at the front there was a large group of drones above the entrance and it looked like the workers were trying to keep them out of the hive. Then I opened the lid and there was another large group of drones on top of the bars. It looks like drone evictions are in full swing. They definitely have more food than they did, but not nearly enough. 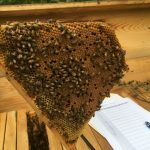 They will need to continue to fill the comb with nectar. 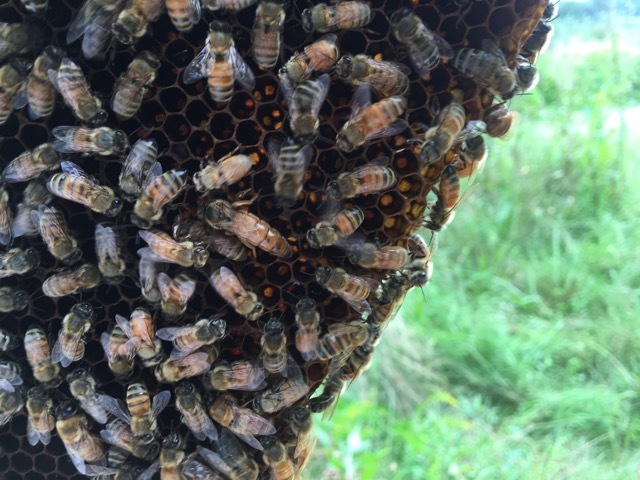 This colony is a good size still and there is plenty of capped brood. I only found a small amount of larvae and there were possibly some eggs. Sometimes the eggs are very hard to see because of the position of the sun. They are looking very good though. I am surprised to see that the colony is still so big. Once I got over to Willow Hive, the weather was changing. The clouds were coming in and it was getting quite windy. Since the wind was picking up, I was only able to look at a few bars. 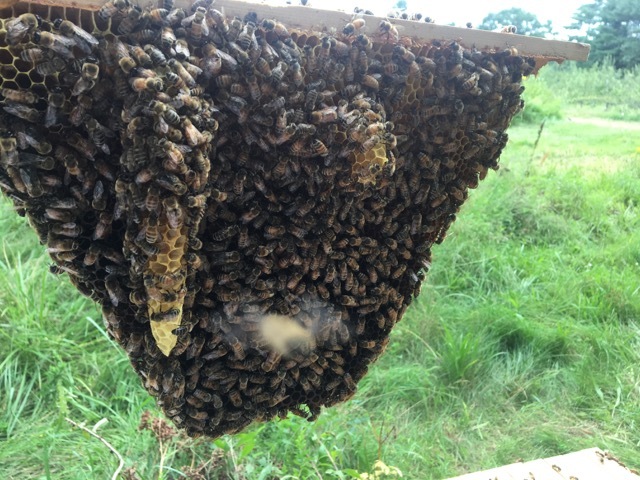 There was a good amount of brood on each bar and some nectar on them. 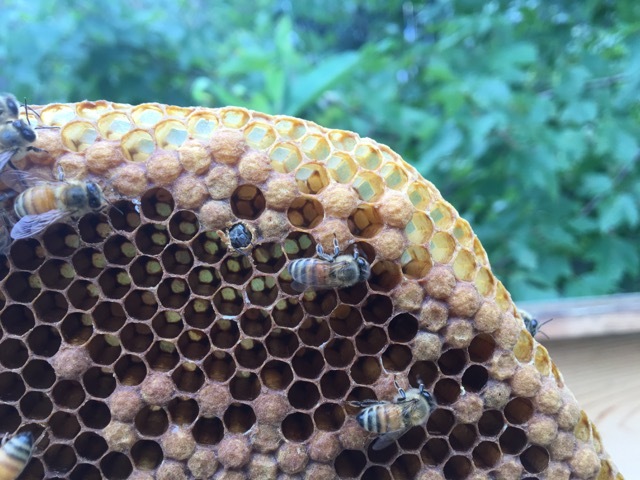 Some of the bars even had a little bit of capped honey. I will have to inspect them more thoroughly next time. I don’t want to take any chances with the comb breaking because of the wind. 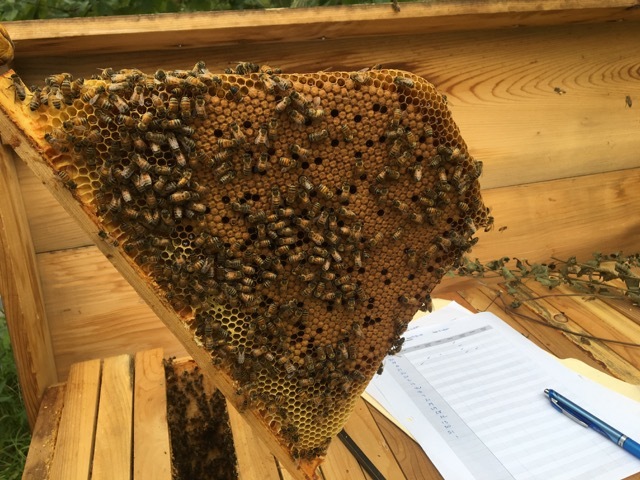 The colonies are both still a good size. 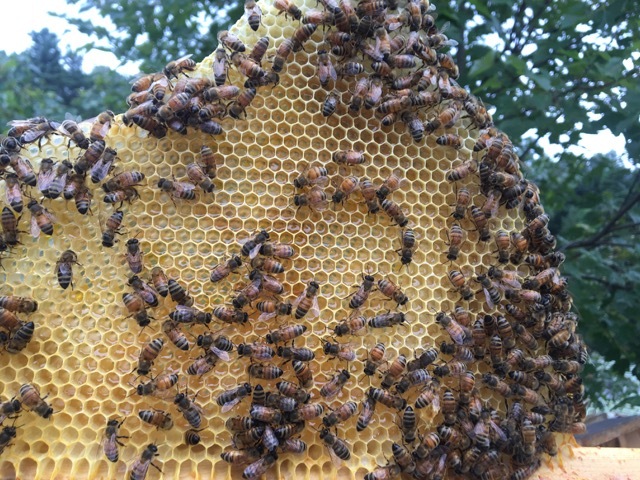 This is the first year that into September I have had colonies this big. 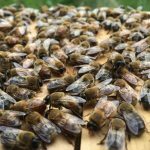 Now they just need to fill their hives with food. 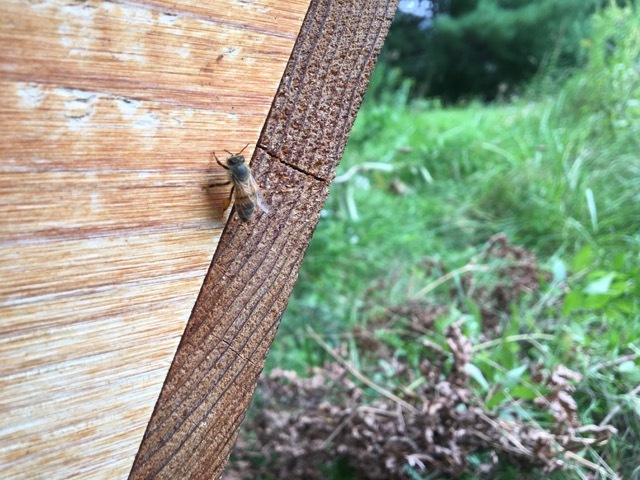 I will be coming back every couple of days to put new syrup into the hives and monitor how much they are taking in. I will also have to return later and oil the lids one more time.